Ty Burr begins his commentary on the death of Sandra Bland with these words: ‘This is the tale of two stories, the official version and the one we can see with our own eyes’. As a nation we are transfixed by the video of a minor traffic infraction that led to a young black woman being arrested in Texas by a white state police officer, being jailed over the weekend and her death allegedly by suicide in that jail cell. What is obvious from the video is that the police officer became enraged when the woman was not as courteous as he would like. He ordered her out of the car and when she refused, he waved his Taser and bellowed: “Get out of the car – I will light you up!” How did a police officer who is trained in de-escalating a situation, contribute to escalating the conflict? How did a minor traffic violation lead to a threat of Tasing, being jailed and to her death? African-Americans aren’t surprised. Ta-Nehisi Coates in his new book ‘Between the World and Me’, writes to his 14-year-old son about the real world and the role of racism. He writes of white justice and black justice. Coates voices the fear of many black parents of what can happen if their son or daughter is not submissive towards a person in authority, particularly a police officer. They understand that while African American’s make up 13% of the population the prison population is 37% black. The family of Sandra Bland understand this reality. They watch the video as Sandra age 28 refuses to be submissive. She advocates for her rights. She refuses to put out her cigarette. She refuses to get out of her car as the police officer becomes more threatening. When she gets out of the car she is thrown to the ground and handcuffed. How did failure to signal when switching lanes lead to such an escalation? Black parents know the answer. Put yourself in Sandra’s shoes. You are 28 years old. You have just moved from Illinois where your family and support system is, to Texas and are about to start a new job. You’ve been berated and arrested and thrown into jail. How would you have felt? What might you have done? Over the weekend while in jail, Sandra died. It is alleged that Sandra took her own life. The family is questioning whether that is true. What is clear is that the police have moved quickly into damage control and have made Sandra’s emotional history the issue. Hopefully there will be a fair and aggressive study of what happened in that jail cell. An investigation of how a trained police officer contributed to the escalation of a simple traffic violation and how a young woman died while under the protection of the police. What is clear is that there should never have been an arrest. 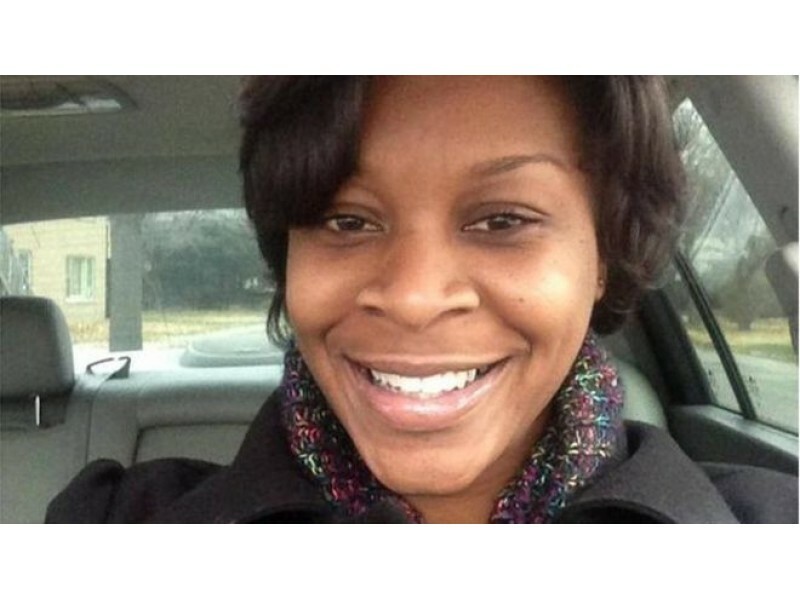 What is clear is that Sandra Bland should be starting her new job at the university. As a Father of two young adult white women, I’ve never given the talk that many black parents give to their children. I’ve never had to coach my daughters about the importance of being submissive towards those in authority. Rather, we’ve raised them to question authority, to stand up to injustice. But I live in the white world. I don’t understand that if you’re black or brown, doing so can get you killed. Not being submissive ultimately killed Sandra Bland. Rabbi Abraham Heschel, famously walked arm in arm with Dr. King over the bridge to Selma. In the face of racial injustice during the Civil Rights era he called for a state of ‘Moral Emergency’. He called people of faith to rise up and say to those in authority, ‘no more’. He called white clergy and laity to stand with our black and brown sisters and brothers and say ‘no more’. Have we reached a tipping point in our nation where we will say no more to racial injustice? No more to the killing of unarmed black men and women by our police. No more to the high incarceration rate of people of color? Are we ready to call a state of ‘Moral Emergency’ and do everything in our power to make our nation a more just and hopeful place? Are we ready to work for a better future for the sake of all the children? Joe, thanks very much for your thoughtful comment. As a retired police officer you know best the challenges that an officer in the line of duty faces every day. As a pastor who for several years served as a volunteer chaplain for both police and firefighters, I have great respect for first responders. On several occasions I wrote letters of commendation for officers who brought great compassion into the most difficult of times. Most police I’ve worked with have been consistently professional. Having said that in watching this video I can only say that the police officer was way out of line. Yes this young woman was argumentative. The responsibility however rests with the police officer to conduct himself in a professional manner. He was trained to de-escalate the matter and quickly moved to escalation. Yes, if the woman had been more courteous then perhaps this would not have unfolded in such a manner. But still the responsibility rests with the police officer to act professionally. He didn’t and the incident moved into the category of tragedy. The issues raised are genuine. Racism and the difference in treatment of black people by some in law enforcement is clear. Yet, having watched this the entire video I cannot help but be struck by the fact that had the woman just signed the ticket and fought the issue in court, this wouldn’t have made the news. None of us have seen the officer’s report. None of us know the reason for his deciding to remove her from the car. But we do know this, an officer can ask someone to step from the vehicle if he or she has concerns about safety, both the officer’s and the driver’s. If the officer says you are under arrest, then you are under arrest. There is no constitutional right to resist arrest. There are a number of legal avenues to pursue if an arrest is unlawful, through the courts. That is the proper place. No one is in any position at this point to determine if the officer was justified. The reports of the stop and the officer’s actions have not been released, but I do know that officer’s must be given the benefit of the doubt during the incident to protect themselves. Bland wasn’t arrested for the motor vehicle infraction, that was the reason the officer stopped her. She was arrested for failure to comply with what appeared to be a lawful request to get out of the car, at least that what we presume at this point. The officer bears the burden of proving it in court and validating the arrest. The street is not the place to argue that. Since the medical examiner ruled the death a suicide, I can only assume there were other issues in that woman’s life we are not privy to. Having had hundreds of encounters on the street with people in all sorts of circumstances, I know officer’s develop a sense for people that are in a stressful or emotional state. From what I saw on the video, the officer’s initial conversation was polite, professional, and geared to evaluate the person. Doing that is critical to surviving as an officer. Did Bland pose a threat? Probably not. Should the officer have demanded she put out the cigarette? No. But it doesn’t alter the fact that Bland contributed to the escalation. In her own words “I can’t wait to get to court.” She should have, she’d be alive and probably cashing a check for a violation of her rights. Sorry it was so lengthy, but this is a difficult issue not easily resolved. Thanks Joe for moving the conversation forward.